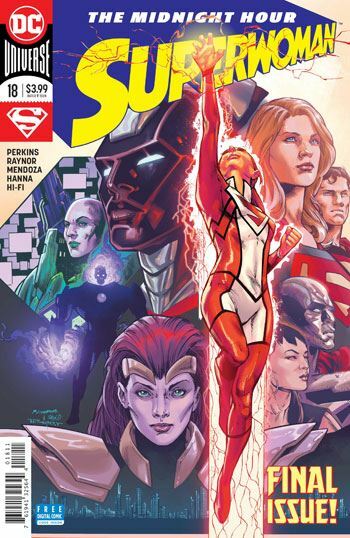 Superwoman comes to an end with issue 18. Can’t say I am really surprised. Probably the best thing about this issue is simply that the last few worked their way up to it. Lana Lang loses her Superwoman powers, but has regained a strong sense of who she is, and what is important in her life. So this is not a half assed ending, leaving things dangling in hopes that a sudden uptick of readership will provoke a return. No, it is a solid ending, which resolves the concepts that Perkins had been working with. So yes, as I thought, under Perkins the book really was all about how women can work together t achieve more than they thought they could as individuals. It’s a bonding, feel-good story, which few tales are, when they centre on the hero losing their powers. I still don’t care for Perkins’ run nearly as much as I enjoyed that of Jimenez, but I have to credit that it chose an unusual tack on a superhero book, and stayed faithful to it. 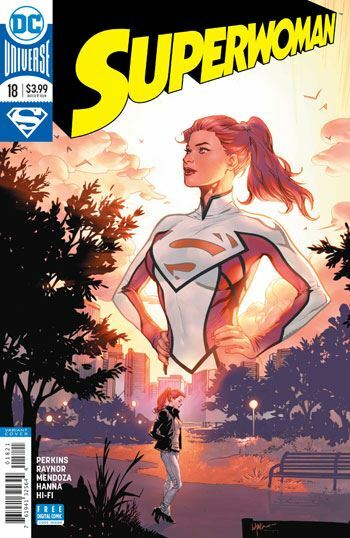 Despite losing her powers, Lana Lang ends her book as a stronger person, with a stronger relationship and stronger friendships, than she started out with. That’s a win, no matter what.